Mexican folk music will be performed by Sonia De Los Santos and her multicultural band on Monday, February 18 at 2 p.m. at the Weis Center. Note that this takes place on a school holiday, President’s Day. The Family Discovery performance is free and tickets are not required. It is suggested for ages 4 and older and the run time is 60 minutes, no intermission. Attendees are asked to bring a canned food item, which will be distributed to local families in need. A free educational study guide is available for this performance and includes information about the instruments used in the show, themes discussed in Sonia’s songs, and much more. The Study Guide can be viewed, downloaded and printed at: http://bit.ly/SoniaDLS or call 570-577-3727 and leave your name and email address and a PDF will be emailed. Bucknell University acknowledges with gratitude generous funding from the family of Janet C. Weis which makes this performance possible. Sonia De Los Santos was born and raised in Monterrey, Mexico, and sings in English and Spanish, playing guitar, mandolin and jarana. With her own multicultural band, she shares songs from her celebrated album, Mi Viaje: De Nuevo León to the New York Island (Parents’ Choice Foundation Gold Award Winner), which is a collection of songs that reflect her experiences growing up in Mexico, moving to another country, learning about other cultures and in the process, feeling closer to her own heritage. This unique concert is filled with original songs, Latin American party tunes and new bilingual versions of American classics. De Los Santos has been hailed by Billboard as “one of the Latin children’s music artists you should know,” and her music has been featured on NBC’s Visiones, Sirius XM’s Kids Place Live and WXPN’s Kids Corner, among others. In ¡Alegría! (Joy!) her second family album, she shares some of the themes that make her happy: migrating butterflies, waking up early, wildflowers, maracas, being grateful to her parents, playing with her band, and of course, singing about birds! 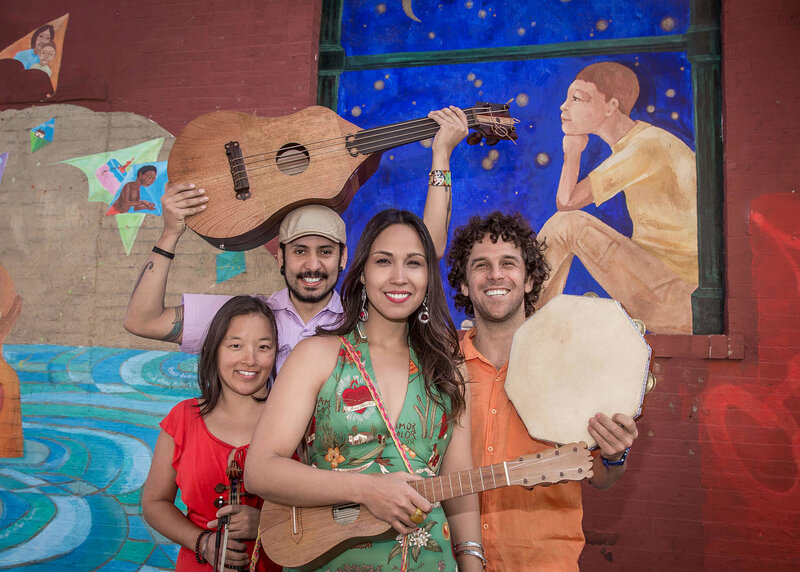 These songs in Spanish and English are inspired by various Latin American rhythms including son jarocho, cumbia, gaita, currulao and huayno hailing from Mexico, Colombia and Peru as well as the North American folk traditions from the United States. This unique concert also includes songs from her debut album, Mi Viaje. Messages of joyful community music making and cultural bridge building will inspire and excite children and grown-ups of all backgrounds.